This is list of some question that are freguely asked about the Morph mod. 4 How do I upgrade, there is no installer? 6 What is a mod? 7 What are the features of Morph? 8 What is the intro sound from? 9 What is the little r in the status bar? 10 MorphXT fails "Test Ports, Official eMule Passes, and I have high ID. 11 Where are credits stored? 14 Why can't I login at the MorphXT site? First check the offical FAQ here, since Morph is based on the offical eMule. The network conditions are different. The network and the availability of sources can changes very rapidly. Posting that Morph is fast or Morph is slow is quite meaningless without details. You load a too aggressive IP filter or anti-leecher profile. Set the IP filter to "0" to disable it and disable the security anti-leecher to test this. Read the FAQ on the official documentation. Read up at http://forum.emule-project.net/index.php?showtopic=4914 specially http://www.portforward.com is good. Look at your modem again. Does it have a build in router maybe that also has to be configured? Enable UPnP. Note that morph uses different upnp than official, but not all rotuers are compatible. remember that a Lot of adsl modems are also a routers. You need to forward ports. Rememeber that a lot of antivirus software contain a firewall(aka anti worm, intrusion detection). You might have to open ports/applications in it again. Open an topic at your favourite board, but give as much details as possible. How do I upgrade, there is no installer? Just copy the files from the binary package into your eMule directory. The only thing really required is replacing the emule.exe. All your credits and current downloads will be maintained. Never throw away cryptkey.dat and preferences.dat from your configuration directory since they represent your identity which is the key to accessing all your credits. A practical method for controlling the upgrade mechanism could be to open the eMule directory and the installation archive in two windows of your file manager side by side, then sort both windows by last modification date descending. This way you'll see which files have changed and need to be added/replaced. Likely candidates for any such incremental change are files for the webserver interface. Note: For some versions a installer is released. But it is better to understand how to do it manually anyway. You did save the Sourceforge mirror page, instead of the final program. You can also see that the exe is only 30 kB. Windows 95/98/ME cannot handle the large resources of Morph and thinks this is a error. You get a out of memory error or corrupt exe report with the suggestion to install/download again. Latest version that is somehow functional in Windows 98 is Morph 9.6. Since eMule is open source (GPL) it is possible to make enhancements to the original program and add new features to it. The programs that have done this are called eMule mods (modifications). The Morph mod contains all the features form official and some more as listed below. You do not need to run/install official eMule to use Morph. Everything is in one big package. This is not a plugin, it a a complete replacement. What are the features of Morph? What is the intro sound from? The intro is from Three Kings. "The Gold" composed by "Carter Burwell" (Three Kings soundtrack)). It seems that the same song is used in black hawk down. Edit: After comparing the two, it seems that it's not the same song, the song "Ashes to Ashes" from BHD just sounds similar. What is the little r in the status bar? r: You are about to be doomed. What is the capital R? R: You are doomed. Upload more. MorphXT fails "Test Ports, Official eMule Passes, and I have high ID. Rejecting connection attempt (IP=209.67.220.58) - IP filter (IP(11/10/04)cable and wireless 1 - port) Probably you activated an ipfilter.dat that contains the line "209.067.220.058 - 209.067.220.058 , 100 , porttest.emule-project.net" Delete that line, you might want to consider using a different ipfilter or disabling if you wonder about this kind of problem. Credits earned by the uploader are stored only locally on the machine of the downloader. So when you download from someone, you will remember them and how much they have given you (you will store their credits in a file on your computer - it is not really legible to a person). If they connect to you, you will give them preferred queue positions until the credit is used up. Credits are mostly useful when two people are both downloading the same file, in which case they are often then used up soon after their earning. Be sure to disable any notification event. You might need Morph 7.8 or higher to this to work. To start Morph normally invisible add "-autostart" to the shortcut for eMule.exe after setting the above settings. Why can't I login at the MorphXT site? Setting this limit too low would result in sub-optimal use of your upload capacitity. the 60-255 option is only there for high speed uploaders (>300 kb/s up) where it would be rediculous to open more than 100 slots. With the default settings Morph will already minimize the number of open slots. This limit is only to prevent bad settings opening many many slots. If Morph cannot set the speed to the set upload speed it will try to add additional upload slots. So the first thing to check is if you upload is set correctly. Is USS enabled? Also check if the setting of "remove spare trickle slots". When the situation that caused the many new open slots solves this should put the trickle slot users back in the queue. Does Morph still open this many slots if you set the upload speed a little bit lower? There is also a slot limiter in Morph starting in 8.5 (in some versions before Morph 8.5, it is there as well, but not configurable). The default upload speed/3 should be an ok limit for most people. The best option to configure Morph right is unlimited. Then you should tune all other parameters until no more extra slots are added. The 60-255 option is available for people with a lot of upload because the /3 rule does now work for high uploaders. Remember that slot focus (minimal slots) has priority over the slot limiter. What version did this occur first? Your speed settings in Morph. Note: That is not (yet) possible for Morph to check if the not reached upload speed is a result of the local line that is saturated, packet loss or the peers are busy. If you are sure the server list is good you might have to disable options->server->require obfuscation server connection (temporary, until Kad is connected?). Also make sure you did not enter a proxy by accident. This same option can also effect global search. Version 10.2 has a error connecting to servers not obfuscated. Just upgrade if you run that version. Also note that the list of available servers might change over time (as of Sep 2007 real donkeyservers and big bang server went nonfunctional). You can find a guide how to Recover list of servers in the guides. Server are overloaded sometimes and will refuse all connections or fail to make a high id connection even if your ports are open correctly. Make sure you pass the port test and refresh your server list. You probably have fake server or servers that spam your search results. Enabling options->servers -> obfuscated connection to servers only can help, but you can also Recover the list of servers. If you have no downloads running, start a few downloads that have many sources. Wait for eMule to connect to a lot of clients for the downloads you've got queued up. This is essential since it will allow us to use the "From known clients" bootstrap feature. Go to the Kad screen. Disconnect from Kad. Choose the "From known clients" option and click on the "Bootstrap" button. an alternative way is to download a nodes.dat file and put the in your emule config directory. 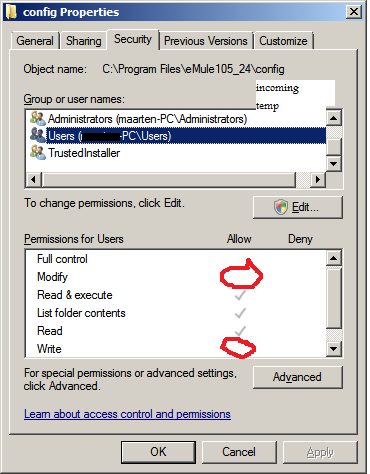 You do not have enough permissions to save in your c:\program files\emule\config directory. Set the installer or extended to save your files in your personal directory or give the "USERS" class write permission in you config directory. Read location of emule config dir how to locate your config dir. In the eMule web interface by default you can only download file via http smaller than 5 MB. The download menu is not availabe for them. You can edit this option in the advanced prefererences "WebFileUploadSizeLimitMB". Setting it to 0 disable the limit. Make sure you reserve upload speed for this feature, since this BW is not managed by the usual bandtwidth management. Try to ask it here: http://forum.emule-project.net/index.php?showforum=28 (official Morph forum) Did you read the sticky of the release you are using? Maybe there your problem is already known? What is your upload line speed, and what limit did you set in the connection settings for upload limits? What country are you in and what is the name of the provider? Are you on ADSL cable or university network? Did you try the FAQ of the official client? Does it have the same problems? You might want to post you question in the support of the official client then. Did you try to disable Kad and UDP? Did you tweak any other settings. Why? Why not? What is the router brand and firmware version? Does it support UPnP and did you enable that in the settings? What version do you use? On Windows XP (including which service pack) or what OS? This page was last modified on 8 August 2009, at 18:08. This page has been accessed 40,610 times.